First published on January 28, 2015. Updated on November 29, 2018. This post will walk you through getting your site up with Google Analytics and properly configured. Let’s get started! First, create a Google Account. This can be your own personal Gmail/Google account if you have one. For departmental blogs or sites with multiple administrators, we do strongly recommend that a new Google Account be created for the group and that the credentials be shared in Stache with fellow administrators. 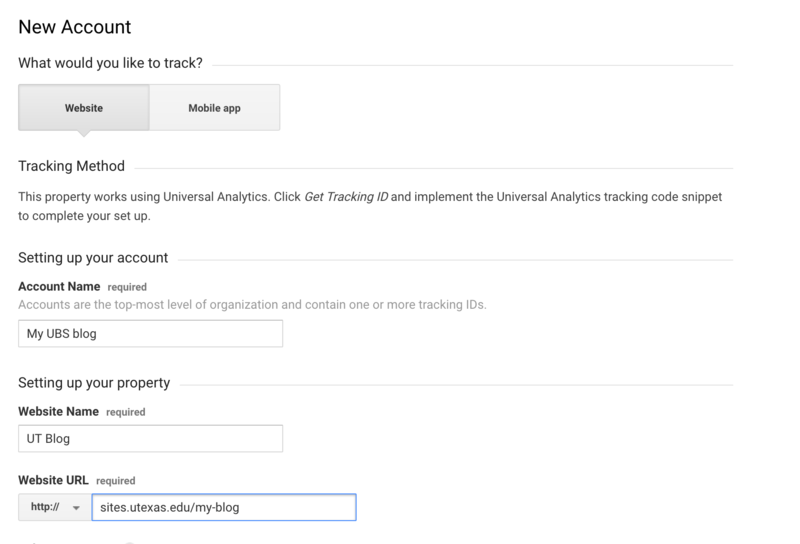 Next, log into the Google Analytics page, http://www.google.com/analytics/web, using the blog’s Google Account. • Click on “Plugins” in the left hand menu. • Click on the “Activate” link under it. The Dashboard will refresh once the plugin had been successfully activated. At this point the plugin will need to be configured to follow the best practices for Google Analytics use on campus. 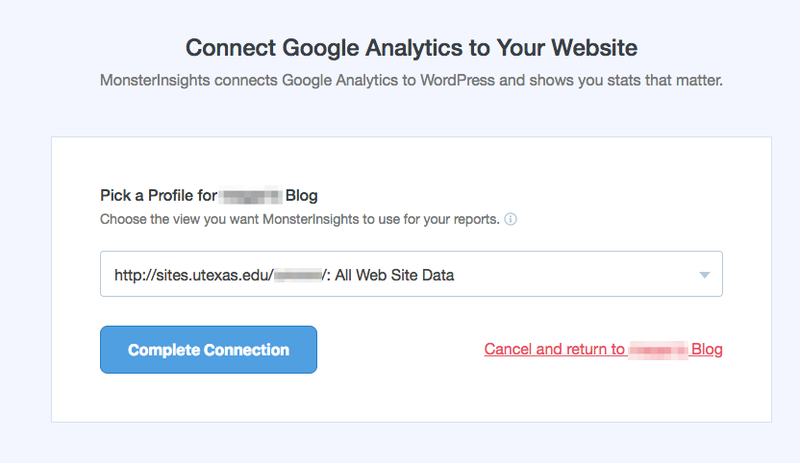 • While still in Plugins, find the Google Analytics for WordPress by MonsterInsights you just activated and click on Settings. • Click “Authenticate with your Google account” and provide the email used to create your google analytics profile, then click “Allow” to allow the plugin to access your Google account. • Select your site from the “Pick a Profile” dropdown and click “Complete Connection”. • You will get a message that it is finishing up and you will be taken back to your site. You will be on a page called Insights. • Scroll down and click “Save Changes”. 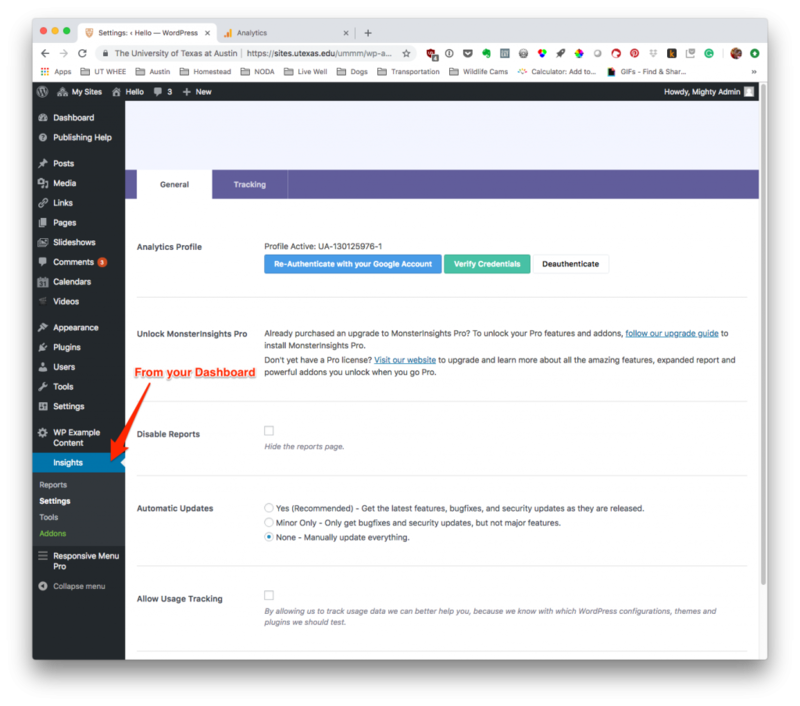 NOTE: On August 9, 2018 Google Analytics for WordPress changed ownership from Yoast to MonsterInsights. This article has been updated to reflect this change.